Yes, another wine column devoted to wines suggested for your Thanksgiving feast. Last week you read about several wines that are ideal for the Thanksgiving feast. Today the last-minute shoppers have a few more to consider. Buttery texture and flavor is the immediate characteristic hitting the palate, carrying delicious lemony citrus and pear flavor. A nice mineral component arrives somewhere in the middle and stays through the finish. Works with everything on the table. Clean, crisp, zesty. White fruits – citrus and pear. Good acidity. Does not overpower the food, but rather stays off to the side and accentuates flavors. A mild, warm, toasty vanilla spice flavor echoes in the finish. On its own this wine has a nice limey citrus and ripe pear flavor, with mild vanilla spice and honeyed flavors as well. A nice enough wine to drink alone, but with the medium-high acidity, it really comes into its own with food, especially with roast turkey and many of the other dishes on the Thanksgiving table. This is a quality Pouilly-Fuisse at a fair price. Smells like Cherry Coke — lots of sweet black cherry, vanilla, and cola aromas. On the palate it tastes like a bite of black cherry mixed with black raspberry and small dose of vanilla spice. Tannins are mild, acidity is mild to medium, becoming more apparent in the finish. A good choice for roasted lean meats such as turkey, and it pairs just as nicely with mushroom dishes and chestnut gravy. This wine has typical old-world Pinot Noir aromas of cherry, earth, leather, blackberry, and a slight hint of vanilla spice. In the mouth it has a glassy smooth texture and warm, round mouthfeel, with flavors of red raspberry, cherry, and a touches of sweet tobacco, spice, and mineral. Acidity is appropriately medium, tannins are mild to medium and firm. If this was tasted blind, I might have guessed it was a Premier Cru Burgundy. It is a fine complement to most Thanksgiving dishes. You can read all about Beaujolais Nouveau 2008 here. Please don’t consider other vintages of Beaujolais Nouveau for Thanksgiving, unless it is for salad dressing. A bottle of Nouveau at the Thanksgiving table is a festive, inexpensive addition, it is enjoyed by many neophytes, and it pairs well with just about everything — including the cranberry sauce. If Nouveau is a little too low-brow for you, then you should consider a “real” Beaujolais — in other words, a Cru Beaujolais. Most decent wine shops will have at least a few on their shelf, from well-known producers such as Duboeuf and Jadot. “Cru Beaujolais” are wines made from Gamay grapes grown in the ten best areas of the Beaujolais region. You will see one of these names on the label: Brouilly, Chenas, Chiroubles, Cote de Brouilly, Fleurie, Julienas, Morgon, Moulin-a-Vent, Regnie, Saint-Amour. These names represent those smaller microregions inside Beaujolais, and represent the best the region has to offer. Some people prefer one Cru over another, but generally speaking, Beaujolais from any of those areas will go very well with just about every dish that can be placed on a Thanksgiving table. They all have cherry and red berry aromas and flavors, good acidity levels, soft to medium tannins, and are extremely food-friendly. Best of all, most cost in the $15 – $30 range, which to me is reasonable for a holiday celebration. Yes, I tasted a lot of Duboeuf, mainly because that’s the brand I find at the shops in my area, and also the brand that you’re most likely to see in your town. Don’t limit yourself to Duboeuf, however, as there are several other Beaujolais producers worth trying. Bottom line is, if you see “Beaujolais” on a wine label, there’s a pretty good chance it’s going to work well with the Thanksgiving feast. Other “reliables” for Thanksgiving matching include Pinot Gris (particularly from Alsace or Oregon), Riesling, Pinot Noir, and Zinfandel. A week from now, the USA will be celebrating the annual “bird day” better known as Thanksgiving, enjoying a feast of myriad dishes surrounding a roasted turkey. As a result, the cork dork within you is running mad with imagination — what wine, or wines, will match with the big bird AND the assorted accompaniments? Look no further than this website to answer that question. The entire WineWeekly.com staff (which consists of me, myself, and I) has already muddled through a “mock” Thanksgiving dinner, for the sole intention of providing you with the best wines for the Great American Feast. Yes, it’s a tough job, but someone has to do it … so let’s talk turkey! First, let’s go over the dinner itself. I “cheated” with the bird — instead of getting a fresh, organic tom and putting it through a proper brine, I bought an on-sale, 13-pound, sodium-injected frozen turkey from a brand called “Riverside”. But, I did at least try to inflict some gourmet wisdom on the formerly feathered friend — I followed this recipe from Lidia Bastianich, which among other things suggests that you stuff and surround the turkey with vegetables (which eventually are mashed into a delightfully tasting gravy), and also offers the idea of glazing the turkey with balsamic vinegar — both for flavor and color. Following with the balsamic theme, I also followed this recipe for roasted green beans, and added simply roasted carrots and potatoes, baked sweet potato, creamed onions, Stove Top stuffing, and of course, cranberry sauce (straight from the can). Finally, I pulled one other “secret” which led to a perfect bird: chilling the breast on ice packs for a full hour before roasting. This lowered the temperature of the white meat, but kept the dark meat at room temperature, and in the end, both meats were equally done (and juicy) at the same time. 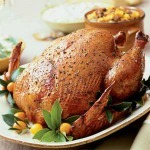 No more turning the white meat to sawdust while the dark meat lumbered its way to 165 degrees! But hey, this is a wine blog so enough with the food … on with the wine. First, I tried white wines. Right off the bat, “Wine by Joe” Pinot Gris was a perfect pairing to everything on the table — and has a nice, soft, flavorful fruitiness that makes it a great choice as an aperitif as well. I recommend it highly for the Thanksgiving table for its versatility. It doesn’t hurt that it sounds like I made the wine (I didn’t, trust me). I next tried a Viognier which will remain nameless, because it simply didn’t work. That doesn’t mean Viogner in general won’t work — its flabbiness and spicy character should match well with many of the Thanksgiving dishes. However this one in particular was not agreeable. Perhaps it was too old, or maybe it was because it was French (just kidding!). The next white that worked was Clean Slate Riesling, which has quickly become a favorite in my home. The rich, ripe, apple-y flavor melds well with nearly everything you can put on a table, and is especially complementary to traditional Thanksgiving dishes — both sweet and savory. If you can find it, get it — it’s reasonably priced and everyone will enjoy it (even the beer drinkers). Next I tried Bouchaine Chardonnay, which to me is more of an aperitif than something for the Thanksgiving table. Its rich, spicy vanilla, apple, and toasty aromas and flavors are exactly right while the house is filling with the smells of baked apple (or pumpkin) pie, roasted chestnuts, the turkey, the vegetables, and the stuffing. It has a creamy, round character and warmness that makes you smile, and though it paired nicely with the equally creamy creamed onions, it was a little too over the top in flavor for the turkey. Nevertheless, I like it as a wine to serve with appetizers and conversation, and there will be Chardonnay lovers who think it is just wonderful with the meal. After the whites it was time to test the reds. First up was Blackstone Pinot Noir, which was surprisingly delightful. I say that because I have a tendency to poo-poo the well-known, mass-produced brands, and as a result am taken aback when one impresses me. The Blackstone Pinot Noir had ripe, bright aromas and flavors of sweet raspberry, cherry, and gobs of strawberry — all of which worked well with the turkey, the stuffing, the onions, the balsamic-roasted green beans, the cranberry sauce … heck, it worked with everything. The best part is, you can find it just about everywhere, and likely for under fifteen bucks. It’s a no-brainer for the Thanksgiving feast. After the Blackstone and another inexpensive Pinot Noir to not be named later, on a whim I tasted MeMo Sangiovese against the plethora of plates. Alone, it had a sharp acidity — typical of Sangiovese — but it was toned down with food. It wasn’t mind-blowing but it didn’t need to be. Rather, it was a fine, unobtrusive complement to everything, in particular the creamed onions, the dark meat, and the white meat drenched in yummy, fatty gravy. Oh, and I picked it up for under ten bucks, so if you’re on a strict budget, go for it. Finally, I tried Rosenblum Zinfandel Paso Robles 2006. It was the most expensive bottle of the bunch, just a shade under twenty bucks ($19.99 to be exact). While I tend to be one who finds every way possible to go against the grain, and in the case of Thanksgiving the “grain” is Zinfandel, in this case I have to go with the “experts” and pundits — the right Zinfandel is an ideal match for the ultimate American feast. Rosenblum, to me, is one of the best quality:price wineries for Zinfandel, and this bottle fit that assessment. It worked perfectly with the balsamic glaze and the gravy; white meat and dark meats both work well. There is some bright raspberry and black cherry fruit, but it kind of falls by the wayside and yields to spicy flavors (cardamom, chocolate licorice, clove) and a big dose of pleasant, creamy vanilla. That creamy vanilla is a nice partner to the creamed onions and also pairs nicely with the roasted carrots and red onions. If there is a problem with the Rosenblum Zin, it is that you likely won’t have enough of it. Once people get a taste of it, and realize how wonderful it is, they will eschew any other bottles on the table. My recommendation is to buy several bottles of it, or make sure you have more expensive Zins or drop-dead Burgundies lined up as an encore, or serve it later in the meal. Bottom line — it’s so far my favorite wine for Thanksgiving. However, the research has only begun. Between now and next Thursday, more wines will be matched with the traditional Thanksgiving feast. Tomorrow, in fact, we’ll be getting the first taste of the 2008 vintage via Beaujolais Nouveau. In a week, I’ll be gobbling, and you’ll have a good idea of what to look for when you walk into the wine shop.